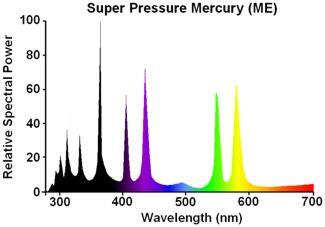 ME mercury lamps have air-cooled quartz arc tubes loaded above 100 watts per centimetre, and this 250W lamp operates at a mercury vapour pressure of around 30 atmospheres. The /D suffix indicates that the lamp is for burning in the vertical base down position only, as the shape of the arc tube is often specially profiled for this orientation. The arc burns between electrodes of solid tungsten to provide a compact light source of extremely high brightness. 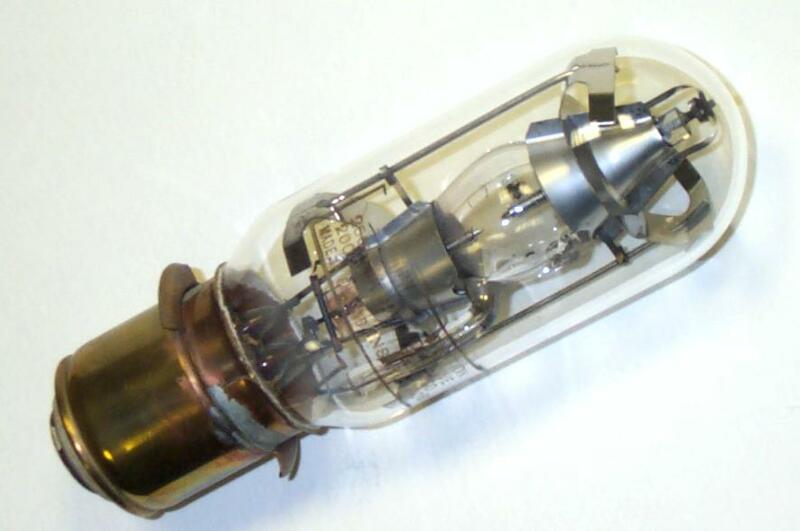 This design of ME lamp has the arc tube housed within a simple hard glass outer bulb, its position being precisely aligned with reference to the plane of the large pre-focussed cap. The arc tube is filled with an argon-neon mixture for easy ignition, and a third auxiliary starting electrode penetrates the side of the arc tube. The arc tube and its end seals to molybdenum ribbon is hand-made throughout. To produce a lamp like this having a very short light centre length, the conventional stem assembly of the outer bulb has been replaced with a flat glass flange with three tungsten lead wires sealed through it, to which the arc tube and its support frame is welded. ME/D lamps were once very popular light sources for monochrome slide and film projectors, film printers, and a great many still live on today in technical instruments such as projection microscopes and profile projectors. In addition to this glass design, a cheaper non-prefocussed lamp was also sold, and a number of types in metal boxes having quartz or glass windows were also made. Today, for new applications they have been totally superseded by the double ended bare arc tube designs such as Osram's HBO range. Initial Arc brightness: 20,000 stilb (approx).